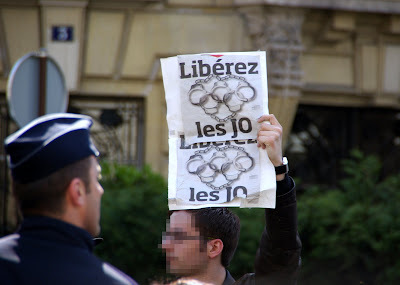 ParisDailyPhoto: Are the Olympics still games? Unless you live under a rock, you probably heard what happened to the Olympic torch yesterday (Monday) in Paris: it had to be put out by officials after numerous attempts to disrupt its progression throughout the streets of Paris. Eventually, the torch was placed on a bus, several times, to protect it from demonstrators. Of course your favorite reporter from PDP had to witness this and so I did! I went to the Place de L'Alma and got caught in the middle of the turmoil. Scary, but fun... Here are some of the dozens of shots that I took there. Eric, you are far braver than I -- those protesters looked very angry! Thank you for showing us what the broadcast media may have missed! Eric, you're the best! If something important is happening in Paris we can count on you to capture it for us! I love the depth of field, and the pixelization of the young man holding the sign give it character. Well, Mlle. Rose, the sadness was there, the Olympics brings a spotlight on it. It is tempting to say "the Olympics are about sport, and not politics". However, there is a moral veil necessary to believe that completely. Hitler's Olympics was viewed by him as a way to promote his country's greatness. The Soviets brutalized the Hungarians in the water polo match one year (1960?) The Munich Olympics were a politcal murder scene. There are always politics in the Olympics. And, should we turn a blind eye on a nation known for oppressive measures? But, is the Olympics a way for people to come together and forget all that for a few weeks? To meet one another as a way to plant the seed of friendship and thus undermine such oppression? It's all so sad that we need to make these choices, but it's more sad to pretend we don't. It's a sad story, but I'm definitely on the Tibetan side. I've been to Mc Leod Ganj last year (the city where the Dalai Lama lives) and spend 6 days with the inhabitants,who are at 90% Tibetans whereas it's in India, and I understood their claim. They have no life for 50 years. It's difficult to talk about politics but this subject diserves to be discussed. This said, the means used are probably not the more efficient...But how to be heard? It's now or never. Anyway, I didn't watch the news (I hate the way they speak about this kind of events) but plan to buy a newspaper tomorrow to be informed. Take a look to Le Monde website for more pictures. You are brave Eric! The news was on the radio here this morning (briefly), and I just saw a little more on the evening news. So, I am really glad to know more and to see the story from your perspective. There is already a rally underway in San Francisco, some protestors climbed the Golden Gate Bridge and hung banners. This is absolutely amazing Eric!! Better than anything we will see on CNN or the BBC or TV2!!! Perhaps one day we will live long enough to see China become the world's largest Democratic Republic. I believe it is only a matter of time. The only real way that one can fight this oppression is to BOYCOTT ALL GOODS MADE IN CHINA. People complain that "everything is made in CHINA", but the companies manufacturing goods there are primarily foreign investors taking advantage of Cheap Foreign Labor! When these investors[American, European, South American etc..]start losing money due to a boycott they will pressure the Chinese to finally do something about their reprehensible record on Human Rights. The only thing these people understand are profits, they don't listen to world leaders or artists or the Dalai Lama. Money is the only thing they listen to, so stop buying Chinese products. The Chronicle has written an article about that, and we had very own little protest right here in San Francisco this morning, when a couple of activits decided to climb up the Golden Gate Bridge and deploy a couple of Free-Tibet banners up there. I put a frew links to the local newspaper's article and TV stations videos, at the bottom of the post so you can see it for yourself if you're interested. Eric, leave it to you to capture this significant demonstration with your camera. Bravo to the French. I wonder what the USA will offer once the torch arrives. I know GWBush has his tickets for the opening ceremonies and has said he has no intention of not going. Go figure, eh? "President Bush, human rights violations, ahem." Tomate, Guille, Jeff...you are incisive and provocative with your comments regarding the atrocities Tibetans are facing daily and some solutions. True, it's sad to disrupt the Olympics, but hey...so is beating and killing our worldly brethren. I feel badly for the athletes who've trained and may be affected adversely, but I feel deeply for those who are striving for sovereignty and human rights, too. Eric, did you feel like you were in danger when you were covering this? I don't know if you monitor the media or not. If so, how would you evaluate the media's coverage of this event? As the saying goes, 'Politics and sports do not mix'. But it's quite apparent from the torch relay that most of the civilised world is opposed to communism and lack of respect for human rights. There are countless people suffering in different countries everyday, not just Tibet or China. Even in countries with economies that look spectacular, there're also citizens enslaved under the regime...it's just not reported in foreign media. I hope you guys get which country I'm hinting at. Guille and Alexandra, I really emailed you the photos this time. I checked my sent box. Tell me if you do not get them, okay? I saw a documentary a few months or so ago and it was about Tibet. They have always been so richly spiritual. They were discussing the advent of cell phones and the Internet, and interviewing people who were concerned of the vice that the young in Tibet were being exposed to via the Internet. They sounded like they were in the middle of a culture shock. I felt very sorry for them as they are so devout to their religion. The Olympics is a stage -- I think like the BIGGEST STAGE. Everybody wants to get into the act! (as Jimmy Durante said). BTW I knew Jimmy Durante when I was young when we lived in Hollywood and Las Vegas -- He was a nice man. That was very considerate of you Eric to not disclose that young man's identity via the use of pixels. You're a knight. For those not familiar with Place de L'Alma, the irony is that it displays solely the arm of the Statue of Liberty, holding the flame. Tonton flaneur, I love that video! I shall now go back to youtube and watch the rest of them! People must always have a right to speak about the issues, whatever their opinion. Bless Parisians for being such ardent protesters. Bless San Franciscans for (ohmygod!) climbing that bridge. Bless Londoners and all the others who have and will make a loud noise for those whose voices have otherwise been squelched. Eric, a great work from a great journalist. Thank you for this inside look about the latest news todays. I think we are really lucky to be able to count on you. I hope, since there are protests taking place in London, Paris and who knows else where still, something will come out of this benefiting Tibet. So Michael, how was Barcelona? We know it was sunny and warm. But you didn't tell us how many Sangrias did you take, where you able to keep score?! I love the Olympics. I have since I was 6 years old when I saw Nadia get a perfect 10 in gymnastics. To me, I think that the Olympics could be such a wonderful event to bring a global community together for a few weeks. It is something bigger than just one country or one policy. I just heard a commentator say, "Competing at the Olympics is the pinnacle of any athlete's career." I just think of the lives of those athletes who train for months, years, and even decades to be able to be a part of something so wonderful. For them, it has nothing to do with politics, with demonstrations, with fighting, or even what country in which the Olympics are being held. They would go wherever the Olympics were held just so that they could compete. Sometimes their events are over in seconds, but they train faithfully every day for their chance to shine for those few brief seconds anyway, possibly to come home with a medal. Even if they don't, they have the knowledge that they were part of something unique. So, I say this, "Bravo" to the athletes themselves and may you continue to work and train and be the hope that this world has for peace, harmony, and friendship. Hi, thanks Petrea for that Al Jazeera link -- that was interesting. and Tonton Flaneur, cool music video -- different. I'm going to save that for maybe the 4 July or 14 July whichever -- both. Tonton, Speaking of music, it just occurred to me that you might like this radio link (if you don't already know) -- it's broadcast from la Tour Eiffel -- I listen to it when I am in Paris and in San Francisco. That way I don't get home sick. Tonton, Ooops! I forgot to give you the link. I'm grocery shopping at the same time I'm sending this -- Sorry, what a goof! Okay, this is not about Tibet -- it is about Asia though. My 'X' Jean-Bastiste Petitpas has been in Japan working. He is a filmmaker. He is "I don't know the word" - he is under the spell of Asia. He is Parisian. I LOVE your slideshow, Eric. It's very dramatic and Beethoven is perfect for it. It's so exciting that you were actually there. Bravo ! As the rest of you I think it's a difficult issue. But a great opportunity to put a spot on human rights. Go San Francisco, your turn! In Paris, the security around the torch was under Chinese command! As a French and a Parisian, I'm shocked. The flame just HAD to be the theme of your post today, glad you were there Eric. I just realised that the person was holding the front page from the popular daily newspaper named LIBERATION or nicknamed LIBE [you can see a bit of red on the top from the logo]. BTW I was trying to spot an ex in the policemen (sweet revenge another trouble he has to deal with: no just kidding). Jeff, I agree entirely with you. I meant sad as in we have this terrible problem in China and at the same time we have the spoil of the Olympics. I can only imagine the amount of work that goes into these cerimonies and the disappointment of the people involved in in the competitions. Look at the problem caused by the introduction of opium mixed with tobacco by the British - by the end of 19th Century over 10% of the Chinese population was hooked in it. The British knew very well that opium was a harmful substance and at the time, in Britain, opium could only be used for medicinal purposes. When the Chinese decided to put a stop to it what did the British do? They declared a war against the Chinese, won it (Hong Kong was part of the fine) and together with most of the world they antagonized the whole of China for decades. The horrors of the British treatment to the Chinese included destroying temples and killing innocent people and using similar excuses as the USA uses for their "Guantanamo Bay concentration, sorry, detention camp"
Economically, it was a total disaster for China and social historians describe the use of opium as a serious blow to cultural values in China. The Chinese only freed themselves from the foreign powers in 1949 with the victory of Mao Zedong and introduction of comunism in China. What China is doing to some is unacceptable but we have contributed to this outcome and now everyone pays the price. I too hope that we will one day see China florishing as a truly democratic nation. I didn't realise I actually wrote an essay! As my office is on the bank of the Seine, between Eiffel Tower and Pont Mirabeau, we were all at our windows yesterday, to attend the "flame show". ... but no flame ! We could have met again! I was also around! There are comments also on my blog. Your slide show is very good - and dramatic! Excellent, Eric. Great photo. I adore the video presentation of your photos on your other blog. Just superb. Rose: I don't mind the essay in the least, it was a very interesting read! Thib: Thanks for the eye-witness glimpse from Paris. This is internet at its best; fast and easy information and interaction between people regardless of their location. No intervention or editing by media, just first-hand accounts. Bravo! What makes me really angry to read, btw, is the comment that says the pro-Chinese demonstrators were not disturbed! Are the police forces and authorities backing China as well? Gah. Love the essay, Rose, thank you. It's never simple, is it? History creates the present. As I said in the comments for the video, my initial reaction was that we must boycott the games. But my husband suggested that shutting the Chinese out of the modern world won't help. He thinks if we engage them, they can begin to emerge from the dark ages. I don't have the answers. But the games are going to happen in China. Can we make the best of it? Would oppression have continued without the games? Perhaps scheduling the Olympics in China gives the demonstrators a world stage they wouldn't have had otherwise. Now the Chinese, who want very much to be part of the modern (economic) world, will have to realize how they are seen by the rest of society. To Christie "I love the Olympics. I have since I was 6 years old when I saw Nadia get a perfect 10 in gymnastics." She was amazing wasn't she? I agree with Tonton & Christie. I think people should protest all they want, but I don't think the athletes should have to suffer over politics. Being from the U.S., we can posture as much as we want - to a point. If China were to call in our debt that they own, we'd be in big trouble. It is horrible that our leadership has put us in this position. "Light the passion, share the dream." Ironic slogan all things considered. Rose, That was interesting. I didn't know that. Thanks for sharing and taking the time to write us an essay. According to the French police authority, all the security around the flame was organised and managed by the Chinese, who could decide which demonstrator was welcome and which was not ;-(. Lili..As citizens of the world we should all be shocked, but not surprised. The nationalistic pride of the Chinese is fueled by propaganda, and the way it is overlooked by the global community is a disgrace. These "Blue Suited" Security guards are the 21st Century version of the 20th century "Black Shirts". I was in Paris when they illuminated the Eiffel Tower all in red light for the visiting Chinese and I heard so many French people complain about it. The French are very much aware of what is going on in the world and I am not surprised by the demonstrations in Paris. Only one world leader has had the guts to stand up to them so far, and it figures it would be a woman, Angela Merkel of Germany. I respect her for taking a stand. pont girl..Everyone makes that comment about the Chinese cashing in their investment in the US economy, but if they did it would completely destroy their economy as well. They would lose their biggest trading partner and their place on the world stage would go back to where it was in 1945. They will have to learn that they cannot expect the rest of the world to swallow the same propaganda they feed to their own people. We all love the Olympics, but Human Rights are Absolute, and that cannot be overlooked. Their funding of the persecution of the monks in Burma and now Tibet is deserving of any and all opposition they receive. Now...back to the beauty of Eric's craft. Merci! Eric, this is great. It's like listening to National Public Radio, hearing people voice honest and intelligent views. You can't find discussions like this on Fox News! I'm really glad you braved the crowds for us. Merci, mon ami. Being a cat, I can say without shame that I hate sports. Mais tout cela est bien triste, de tout point de vue. Sachez que vous avez un Chat à Paris qui respecte énormément votre travail. 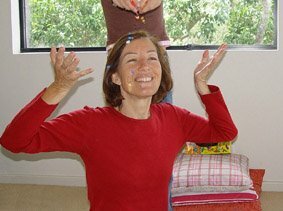 Ma maîtresse vous adore aussi. You're in my links ! Rose, thanks for that link. It was delightful to watch her again. She really was perfect! Thanks so much for that link. It was great to see it again...I should my children and they were all impressed. Petrea you must have meant Jeff, not me. Thib: I guess we shouldn't be surprised at this, but I still am to some degree ... ! So who's in San Fran then and can update us on the flame shame?